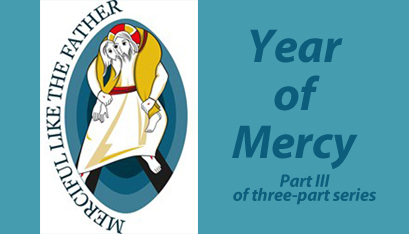 In our brief series concerning the Catholic Church's Year of Mercy, we have explored why Pope Francis announced this special year and what "mercy" is all about. We have seen how mercy is at the center of who God is and, therefore, how it is at the very heart of Jesus' ministry and mission -- and the mission of the Church. We might say that mercy is both a noun and a verb: mercy that is given or received; but also a way of living and a fundamental attitude or lifestyle of being merciful. Mercy is a central part of our vocation to follow Jesus. It is a lifelong project to grow as a merciful person. St. John Paul II points out that mercy "is not just a spiritual transformation realized once and for all: It is a whole lifestyle, an essential and continuous characteristic of the Christian vocation." The Year of Mercy invites us to think of ways that we can be merciful. Before we do this, let's recall briefly how we experience God's love and mercy.  for example, in baptism we receive the gift of new life from God, given out of His love and mercy. St. Paul reminds us that, "not because of any righteous deeds that we had done, but because of His mercy, He saved us through the water of regeneration and renewal of the Holy Spirit" (Titus 3:5).  The Eucharist makes present again Jesus' sacrifice on the cross, which brings us mercy and forgiveness. It is also a real encounter with Jesus, who is mercy -- or, as we say just before receiving communion, "Lord, I am not worthy that you should enter under my roof, but only say the word and my soul shall be healed."  In reconciliation, God, the Father of mercies, grants us the wonderful gifts of pardon and peace. There are indeed so many ways that God has been merciful to us, and for this we can give great thanks. But there is more: Jesus requires us to be merciful, not least because we have received mercy ourselves and we are commanded to imitate and live this gift. Two parables really bring this home. In the parable of the two debtors (Matthew 18:21-35), a servant is forgiven an enormous sum of money that he could never hope to repay. (Some say it was an equivalent of something like six million days' wages.) This same servant then refuses to forgive a relatively small debt that a fellow servant owes him. The master is enraged and says, "You wicked slave! I forgave you all that debt because you pleaded with me. Should you not have had mercy on your fellow slave, as I had mercy on you?" In the parable of the Good Samaritan (Luke 15:11-32), Jesus answers the question, "Who is my neighbor?" He tells how the Samaritan, an outsider and a despised foreigner, showed such great love and mercy to a man (who was, in a way, his enemy) who had fallen among robbers. Jesus ends the parable with a stark command: "Go and do the same." Pope Francis often speaks about the great need for people in our world, namely our neighbors, to experience mercy: "We need Christians who make God's mercy and tenderness for every creature visible to the men of our day." St. Augustine reminds us, "Mercy is the showpiece of the soul." But how can we be merciful? Mercy is a very practical and real thing, not just some nice concept or idea. There are so many ways that we can respond to the mercy that we have received by showing mercy to others. In our Christian tradition, there are two main ways we can do this: the corporal and spiritual works of mercy. They are based on the final judgment, discussed in chapter 25 of Matthew's Gospel: "Lord, when did we see you [hungry, in prison and so on]?" The corporal works of mercy are: feeding the hungry, giving drink to the thirsty, clothing the naked, sheltering the homeless, visiting the sick, ransoming captives (think of human trafficking, for example) and burying the dead. The spiritual works of mercy are: instructing the ignorant, counseling the doubtful, comforting the sorrowful, admonishing the sinner, gladly forgiving injuries, bearing wrongs patiently and praying for living and the dead. That's a pretty comprehensive and challenging list. It would be quite a project during this Year of Mercy just to take one of those works of mercy and try to live it! Mercy, then, is a wonderful gift and a gift that is to be received, but also given. It is a true blessing and a wonderful sign of hope for our world. It is life-restoring and life-giving, both for those who show mercy and for those who experience mercy. As Shakespeare wrote eloquently: "The quality of mercy is not strained; it droppeth as the gentle rain from heaven upon the place beneath. It is twice blest; it blesseth him that gives and him that takes..."
We have experienced so much mercy. Let us, in turn, also be people of mercy.